Thank you to everyone who participated in this giveaway! 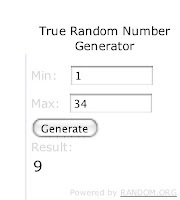 The lucky winner of Roundabouts Cupcake Sleeves is.. Comment number 9! Congratulations, BusyMom! First, and this is the mandatory entry that must be done in order for any bonus entries to count, visit www.roundaboutsleeves.com/ and tell me which Roundabout Cupcake Sleeves you want if you win. It can be anything from their selection of over 70 designs, although I personally have to throw in my vote for the "Santa Oops Chimney" sleeves because I think they're hilarious. Okay, once you've done that, you may complete any or all of the following bonus entries, just be sure to leave a comment for each entry so it counts. Just like my other giveaways, the winner will be chosen by random.org based on comment number, which is how each comment equals an entry. Come up with your own original idea for a Roundabout Cupcake Sleeve design (they do custom orders, you know) and leave a comment here describing it. Leave a comment on my Roundabouts Cupcake Sleeves review post. This giveaway ends December 10th at 11:59 p.m. One lucky winner will be chosen at random from all the entries on December 11, 2010. If you're not on Twitter, Blogger, Facebook, or Google, please leave your email address in your comment so I can contact you. Winner will have 48 hours to claim the prize. Good luck! I like the popcorn buckets - do they come with instructions? So many cute ideas, I'm just wondering if I could recreate without directions. I also liked Darla's Cake Blog on Facebook. I like the hamburger ones! They would make my son's birthday party a lot of fun and easy! I think I would design one with my own logo on it. It's a clean design and if I did a trade show or sent them to work with my husband, it would help get the word out! I like the Sweet Margarita sleeves! Tweeted 11/29. Just realized I missed a day! I would love to win the just like sushi ones to use for my daughter's birthday. I follow them on twitter as kmayans. I like Roundabouts cupcake sleeves on Facebook! I like Darla's cake Blog on Facebook! Since both of my boys birthdays are coming up in Jan. and they both love race cars - I'd have to get the race car sleeves. Aren't they all cute! Great idea! I left a comment on your tutuorial post.